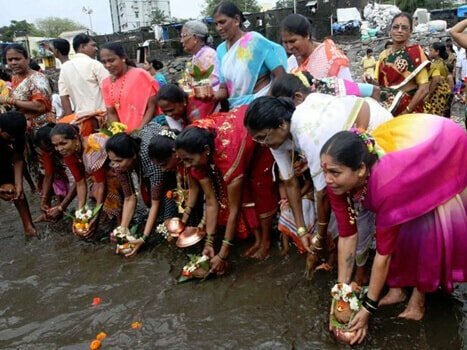 Narali Poornima or Coconut Festival is celebrated by the Hindus of fishing community of Maharashtra with a lot of fervour and on the full moon day or Poornima of the month of Shravan, which also happens to be one of the auspicious months of the Hindu calendar. The festival also goes by the name of Raksha Bandhan, Rakhi Poornima, and Shravani Poornima. Naral means coconut and on the full moon day in the month of Shravan, coconut is offered to the sea and hence, the name. The festival is celebrated to mark the end of the monsoon season, as the fishermen now can begin fishing safely and start-off with their trade. Apart from offering coconut to Varuna, the sea-God, people also worship the sea and offers prayers so that the God keeps them safe while they are out in the sea, fishing. No fishing is done during this period and no fish is consumed as well. It’s only after Narali Poornima, after a coconut has been offered to the God at high tide that people can start fishing and consume fish. The traditional food of this festival is a sweet curry made from coconut. Raksha Bandhan is also celebrated on the same day. Sisters tie rakhi on the wrist of their brothers that is also known as the thread of protection. Raksha Bandhan is age-old festival in India and it was prevalent even during the Indus civilization. The story of Rani Karnawati who sent Emperor Humayan a rakhi to seek protection of Chittor against Bahadur Shah, the Sultan of Gujarat is one of the most famous stories of Raksha Bandhan. Even Draupadi had tied a rakhi around the wrist of Lord Krishna who protected her always. Rakhi is celebrated as Narali Poornima in the Western Ghats and offering is made to Lord Varuna. It is a one-day festival. Fishermen repair their boats and fishing nets just few days before the festival. They paint their boat as well and decorate with flower garlands. New boats and nets can also be purchased. Traditional naral bhaat or coconut rice is prepared along with narlachi karanjis on the day of the festival. They throw coconut into the sea after the celebration is over and Lord Varuna is worshipped. Narali Poornima happens to be a very important festival of the Koli community. Men and women dress up in the traditional way and come together for a procession during the evening between 5 – 6 PM. They offer golden coloured coconut to the sea.